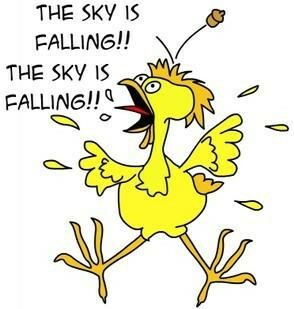 The Sky Is (Always) Falling! The sky, it seems, is always falling. Fear is such a powerful, and useful, motivator. According to historian John Fea, evangelicals cast their votes in recent elections motivated by fear. More broadly, it is fear that has lead some Christians to make rules (such as “Don’t dance!”) to protect against the possibility of sin. It is fear that leads some to create fortresses or to demonize their neighbors. Fear leads some to be intolerant of those different lest they or their children or their churches be corrupted by those differences. Fear of losing otherwise good things like freedom and money turns these things into idols to be protected at all costs. Fear becomes the leash that a charismatic leader uses to retain access to the contributions and devotion of his followers. Fear is powerful and ubiquitous. And though it is effectively used by all sides in social and political disputes, I’m concerned most when it is used so effectively among those who have the least cause to fear. And Christians, we have the least cause to fear. I was reminded that the sky is always falling when I read this paragraph a few months ago. That which could have been written yesterday was actually written in 1975 (by Richard Lovelace in his Dynamics of Spiritual Life.) Lovelace was not panicked or seeking to induce panic. But his observation simply illustrates that the sky that is falling now was falling 40 years ago (and centuries before that as well, in different ways). To know that the culture can always seem to be in some ways on the verge of collapse should temper our response to the news of the day. Problems have been met before. They will be met again. Fear should not be our guide nor should we follow a leader just because he/she promises to keep the falling sky at bay. Our response to issues, which certainly should be vigorous and based upon an accurate assessment of reality, can afford to be thoughtful because the difficulties are not really new. Panic leads us to be hasty. Christians should not be hasty. Christians can afford to be un-hasty because they know the one who upholds that falling sky. It is not inconsequential that ‘Do not fear’ is one of the most repeated refrains of the Bible. Preachers should make more of this, and of the power and ways and faithfulness of God, and less of the symptoms of the falling sky. Fear drives us into the arms of the demagogue and the false messiah. Eyes cast upon the living God, on the other hand, grow in confidence and perspective. And courage. Yes, the sky is probably always falling. But those who “…believe in one God, the Father Almighty, Maker of heaven and earth, of all things visible and invisible….” should be the last to be motivated by fear. Twain was a cynic unimpressed with power and pretense. He skewered those presuming greatness and mocked those pretending to be good. In Grant Twain saw the greatness others saw, but he saw it rooted in a fundamental goodness of character. 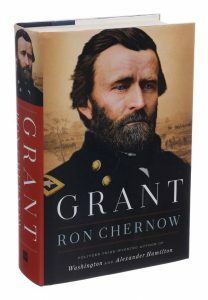 Grant was, as Twain noted and his biographer (Ron Chernow) reveals, a fundamentally decent, honest, and principled man. He was human and not perfect, but nevertheless he was superlatively good. Few will find greatness thrust upon them like Grant. Fewer still will rise to the challenge. But decency is within reach of us all if we but honored it and sought it. And in the long run, such goodness will be of much greater consequence. On October 31, 1517, Martin Luther took one small step for a man, one giant leap for mankind, onto the slippery slope. The slippery slope is, to many, a place no one committed to orthodoxy and historic Christian doctrine should ever be found. But Brother Martin never got that memo. So with a few quick strokes of the hammer, he ventured onto it. And yet we honor him five-hundred years later while we excoriate others who follow in his footsteps today. Defenders of slippery slope alarmism will take issue with my suggestion. It is frequently suggested that this slope leads only to ruin. Therefore, Luther’s act was one of courage, not slippery-slopism. I don’t deny his courage. It is always courageous to take a step that puts one at odds with one’s peers. But to advocate for change when change is needed always puts one on a slippery slope, and that, as it was with Luther, is a good and necessary thing. One concerned writer, in a lament over the descent into liberalism of a previously orthodox minister and as a caution to any who would venture onto the slippery slope that led him there, defines the slippery slope as “the unstoppable descent into liberalism and unbelief that begins when the authority of Scripture is compromised out of cultural accommodation.” He then maps the route to that slope: “In the late-20th century and early 21st century, the slippery slope has tended to begin over the issue of women’s ordination.” At this point of cultural accommodation, he suggests, the slippery slope begins. The slope, being slippery, inevitably sends one careening to the pit of ultimate unbelief. He jokingly (I think) presents his case as example number 4,742. Would I win if I could produce 4,743 examples of those who took that step and did NOT descend into unbelief? Taking this issue of the ordination of women alone, often those who have embraced a change on this (I am not one of them, if that helps) have done so as a result of listening to the voices revealing skewed treatment of women in the church. They have revisited Scripture to see if somehow their previous reading had been wrong. One may not agree with their conclusions. But we must accept that there is a time when we need to be awakened to our mistaken views and have them corrected by scripture even if it means taking a stand against the ecclesiastical powers that surround us. I think Martin would agree. 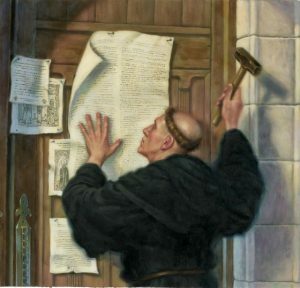 We who celebrate the Reformation have a motto supporting this idea: Semper Reformanda. This motto calls us to be sufficiently humble regarding our convictions that we are willing to constantly submit them to the scrutiny of scripture. Yes, to face the possibility of error and to suggest possible correction is to step onto a slippery slope. That does not always lead to unbelief. It sometimes leads to necessary change. Let’s engage those on the slippery slope, let’s hear them, let’s learn from them, let’s examine the Scriptures with them. But let’s not dismiss them. One of them might be named Martin.